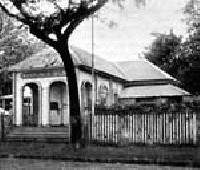 Post office building of Papeete in 1875. Postage stamps as a means of prepaying postage on mails were first introduced in Tahiti on October 25. 1862, by a decree of the 16th. of that month. The use of postage stamps was still facultative and the possibility of prepaying postage in cash remained. Four different kinds of postage stamps were made available to the public, all in the so­called "Eagle"­type of the general issues of the French Colonies, in the values of 1, 5, 10, and 40 centimes. These, and later issues of the French Colonies until 1882, can only be recognized as having been used at Tahiti if they are on an entire letter or if the postmark is clearly legible so that it can be fully identified. 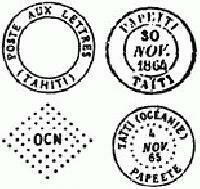 Originally the postmark of Papeete consisted of a lozenge of 49 points, inscribed "OCN" for "Océanie" in the center. Later on, circular datestamps were introduced showing the name of the post­office and the date. In general, it can be said, that stamps of the general French Colonial issues with Papeete postmarks are scarce, although some values are found more easily than others. It is evident, that mails from this small and far­away territory were less bulky than those from other, more "important" areas from the political or economical point of view, such as Indochina or the Antilles. There are even stamp issues and values which appear never to have been sent out to Tahiti at all. Strangely enough, even in this very early period, philatelists seem to have been active already, for stamps have come to the light which were unmistakably "cancelled­to­order" at the request of dealers or collectors.